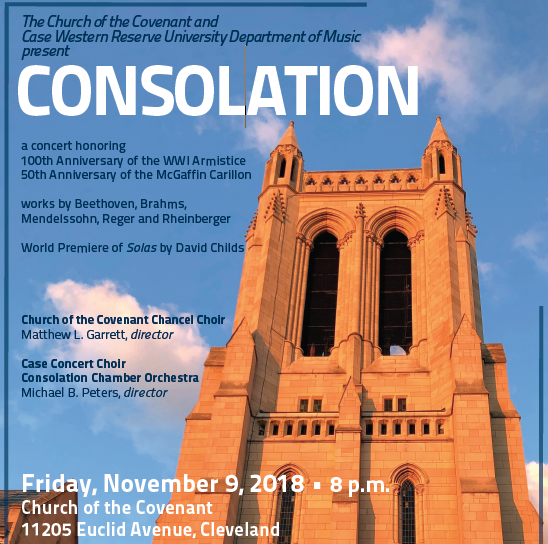 The Church of the Covenant and the CWRU Music Department present a unique collaboration program commemorating the 100th anniversary of the World War I Armistice and the 50th anniversary of the McGaffin Carillon. A new work by composer David Childs, commissioned for the occasion, will be premiered. Performing ensembles include Case Concert Choir, Church of the Covenant Chancel Choir, and the Consolation Chamber Orchestra. Musical selections include works by Romantic composers Beethoven, Mendelssohn, Pearsall, Reger, and Rheinberger. The performance also features the world premiere of Solas by David Childs, commissioned in honor of the 100th anniversary of the WWI Armistice and the 50th anniversary of the McGaffin Carillon. Dr. Childs will be present for the first public performances of the work and will speak about his composition on Sunday, November 11th at The Church of the Covenant at 11:30 a.m.
Join us for an evening of musical healing through texts intended to console those suffering or those mourning the loss of loved ones. Tickets are available online or at the door: $10 general admission | $5 adults (60+) and CWRU staff/faculty | free for students with ID. Free parking available. 2018-19 marks t he 50th Anniversary of an exceptional partnership between Case Western Reserve University and the Cleveland Institute of Music. Since 1968, these two distinguished institutions have participated in an integrated music program at the undergraduate and graduate levels. The JMP allows students at both institutions to take advantage of the resources of a major research university as well as those of a leading conservatory.